We advise all applicants whose passports are valid for more than 6 months or who are travelling to Kenya soon to apply for the 10-year ePassport in Kenya. Applicants who cannot travel to Kenya will have to wait until the Embassy is equipped with the ePassport biometrics capture equipment. Applicants who are 18 and above but do not have valid ID cards must however travel to Kenya to apply for and be issued with a ID card before applying for a passport. Verification codes are currently only being sent to Kenyan numbers. You must therefore enter an active Kenyan number (even that of a relative or friend who is not a passport holder) to be able to get the verification code sent to that number. Ensure that you enter the correct country of residence when filling in the onlie application otherwise your place of residence will remain the default AFGHANISTAN. Those who changed their names after marriage/divorce or through deed-poll after obtaining their ID cards must click on the application 3.MODIFICATION in order to have the correct name entered on the form. ePassports are only issued if your biodata details (fingerprints and photos) have been taken by the issuing authority, which is currently only in Kenya. If you are not able to travel to Kenya for biodata capture, you will be issued a normal passport that must still be replaced before 31st August 2019. We advise all applicants who are travelling soon or whose passports are valid for more than 6 months to travel to Kenya for biodata capture and issuance of the ePassport. The Department of Immigration has rolled out issuance of the e-Passport with effect from 1st September 2017. Holders of manual passports will be allowed to use them until 31st August 2019, after which they will be rendered invalid. All applicants must register on www.ecitizen.go.ke using their Kenyan ID card and fill in the application online and the passport fee must also be made on the same page via MPESA or credit card. Applicants who are over 18 and do not have a valid Kenyan National Identity Card will no longer be able to apply for a passport replacement. You must travel to Kenya to register and be issued an ID card. The Embassy in Berlin does not issue ID cards. If your passport has expired, you will be issued a one-way Emergency Travel Document by the Embassy in order to travel to Kenya, to process the ID card. Scroll to the bottom of this page for further information on how to obtain an Emergency Travel Document. Kindly click on this Youtube link to find out how to register on eCitizen. Kenyan passports are available for ten years and are non-renewable. They are not available beyond ten years from the original date of issue. If at any time a passport contains no further space for visas, a new passport must be obtained. The same applies for if any official changes are required e.g. a change of name after marriage. The Embassy does not issue temporary passports. All passports that are not ePassports will only be valid until 31st August 2019. Caution: Passports are valuable documents and should not be altered in any way or allowed to pass into possession of unauthorized person. If lost, withdrawn or destroyed the fact and circumstances should be immediately reported to the Kenya Embassy and the local police. Under such circumstances, new passports can only be issued after exhaustive enquiries have been done. Application for a new passport must be done well in advance, at least 6 MONTHS before expiry of the passport or your intended date of travel. It takes up to 12 weeks or more to process the Passport. DO NOT BOOK ANY TRIP OR HOLIDAY UNTIL YOU HAVE A VALID PASSPORT. Kindly note that the Embassy endeavours to assist all Kenyans in emergency situations but will not support the negligence of an applicant who fails to check on the validity of his/her passport. All passport applications must be recommended by the holder of a valid Kenyan passport or ID card, who is not related to the applicant. YOU CANNOT RECOMMEND YOURSELF, YOUR CHILD OR ANY OF YOUR RELATIVES!!! If your recommender is not in your area of residence, you must send him/her the recommender's page to fill in and send it back to you per post together with the relevant pages of his/her Kenyan passport or Kenyan ID card as stated on the checklist. AN APPLICATION THAT HAS NOT BEEN RECOMMENDED WILL BE RETURNED TO THE APPLICANT. Visit www.ecitizen.go.ke. You will need your Kenya National Identity Card number to be able to register on the ecitizen website. If you have a 1st Generation ID card (ID cards with entries that were made using a ball-point pen), you will not be able to register on eCitizen. You will therefore have to travel to Kenya to be issued with a New Generation ID Card first. If you happen to have lost your passport, contact your local lost and found office to see if the passport was found and deposited there. You can also email the Embassy (immigration@kenyaembassyberlin.de) to find out if the passport might have been sent to us. If your search remains futile, you will have to report its loss at your local police station and then proceed to a Notary Public to swear an Affidavit on the loss. The Kenyan passport remains property of the Kenyan government and should be handled with extreme care and kept safe at all times. You are advised to only carry coloured photocopies of it and of your residence permit (if it is stuck inside your passport) for identification purposes. Passports should not be carried to night clubs or any social gathering, since these are the most common reported areas of loss. If you are the holder of a valid Kenyan passport or your child was born while you are still a Kenyan, you can apply for a passport for your child by filing the relevant application on eCitizen. If both parents are Kenyan, it is the parent who bears the same surname as the child who should file the passport application. Children who have other nationalities and are over 3 months old, must provide the passport of the other nationality too when applying for the Kenyan passport. If the passport of the other nationality is not available, you will have to provide proof from the other country stating that the child does not hold a passport of that country. If the child is solely Kenyan and is over 6 months old your application will be considered a late application. You will have to provide an official letter explaining the late application as well as certified copies of the International Birth Certificate of the child that have been certified by the issuing authority. Women who have married and taken up their husband's surname must apply for the change of name on their Kenyan passport too to avoid complications in the future. You will have to fill in your names as stated on the marriage certificate on the passport application form. Apply for 3.MODIFICATION on eCitizen. A change of name for Kenyan children can only be made if an official adoption is filed for and approved by the High Court of Kenya and an official change of name through deed poll done and a Kenya Gazette Notice of the same is issued. The Ministry of Gender, Children and Social Development also has to issue a Letter of NO OBJECTION to ADOPTION. You will have to provide certified copies of the High Court of Kenya documents as well as certified copies of the name change documents and Letter of NO OBJECTION as stated above. All applicants must appear in person at the Embassy after booking an appointment, to submit their application and have their biometric-data captured. The modalities of obtaining an appointment will be unveiled together with the application procedure. The old passport must be cancelled before the ePassport is handed to you. All applicants will therefore surrender their passport once the ePassport is ready. You will be notified to send your old passport for cancellation via DHL or any other courier service. Applicants can choose to either surrender the old passport together with the application or submit it later when the ePassport is ready either personally or via DHL. (d) A 1,45 cents stamp for the A4 envelope. The DHL envelopes are prepaid and do not require stamps. Enter the Embassy address on the "Absender" Section of one DHL envelope and your name, address and telephone number on the "Empfänger" section. Also stick the ZUSATZMARKE on the specified field of the envelope. This envelope will be used to SEND YOU your passport(s) back after issuance. Also enter your name and address on the A4-SIZE 1,45 cents envelope. It will be used to send you the confirmation letter and receipt of the passport fee you paid. You can present this letter to authorities as proof of having applied for a passport/replacement. Applicants from other countries can submit their old passport via any courier service available in their country of residence and also arrange for the same courier company to pick up the passports when notified by the Embassy. If you were born in Kenya but have never held a Kenyan passport or ID card or only have a recently issued Kenyan birth certificate, you cannot apply for a Kenyan passport or be issued a Travel Document by the Embassy. 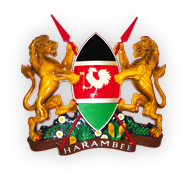 You will have to apply for a Travel Document for Foreigners at your local Foreigner's Authority and then apply for a Referred Visa from the Embassy to facilitate you to travel to Kenya to process a passport. If you are sent by your local Foreigner's Authority to apply for a passport or Travel Document and you fail to bring the application documents, you WILL NOT be issued any confirmation letter as proof that you were at the Embassy. If you have to travel to Kenya and do not have a valid passport, you may be issued an Emergency Travelling Document to allow you to travel to Kenya. Click here for the checklist of requirements.